Sometimes when I see people doing the 31 kumijo partner practice I get the impression that they are moving through a sequence of dance steps, memorized and practiced until they become automatic. Often it looks smooth and coordinated, as if each person knows what their partner is going to do next, which of course they do. But as nice as this all works out, there is often something important missing: a martial mentality and focus on the silent interplay between attacker and defender. It is this interplay that breathes martial life into these forms and informs them with the practical reasons for why the moves are what they are. Without the players adopting both the physical moves and the mentality and intentionality of their respective roles the awase can never be complete. Memorizing the moves is important, but knowing the psychological cat and mouse game between attacker and defender makes the practice more authentic and more fun. I think of the silent intentionality of each partner as a psychological script, an explanation of the reasoning, strategies, and changing fortunes in the form as it unfolds. The way to understand the script is to watch the form and at each move ask, "why is this happening?" Unfortunately, or fortunately perhaps, there is no published script of the psychological interplay of this form, it really must be inferred from the movements. For instance, at class last night there was a question about when the attacker should begin to raise his weapon after move #8, in which the defender has his or her back turned toward the attacker. This position is the one shown in the photo. Sometimes you will see the attacker initiating by raising the jo as though for a shomen strike, even before the defender has moved. This could make sense in terms of the script if the defender has not visually captured the attacker with a glance to the rear. But if the defender has acquired the attacker visually, as Tatoian Sensei always told us to do immediately on finishing the strike at #8, then why would the attacker initiate a strike that would be fully anticipated by the defender? In the script, which follows the psychology of life and death, to have your opponent know your mind and intention is an extreme disadvantage that any martial artist would seek to avoid. So, if the defender has captured the attacker visually before another move begins, then the attacker is much better off remaining in ken kamai stance and abandoning the idea of an easy kill from behind. This change in strategy has been forced by the quick eye movement of the defender, effectively freezing the attacker in his tracks, and forcing a reconsideration of what to do next. After class I went home and watched a few videos of Morihiro Saito Sensei practicing and teaching the 31 kumijo, and in every instance I saw the attacker at move #9 hold position until it is apparent that the defender has taken the initiative with a powerful sweep of the jo, and the attacker raises and retreats into shomen uhci komi position. The psychology of the attacker here is: "oops, I guess my opponent figured out my plan, I'll wait to see. . .uh oh, here he comes, I better make room and position myself for whatever chances I may have next." There is another place in the kumijo that is very complicated and almost impossible to figure out without having decoded the script first. This is the sequence between moves 19 and 22. In this quick succession of moves the defender creates in the attacker cascading waves or emotion alternating between triumph and panic. At move 20 the attacker initiates a fierce yokomen strike only to find, at the peak of the strike, that defender has slid in underneath it with a deadly strike to the knees. This requires that the attacker immediately shift into full flight mode and step back to avoid and parry the defender's strike. It all happens very fast. Once during a class on this form Tatoian Sensei began to lecture us on how we were just mindlessly going through the moves without actually living the form with our minds and bodies. He stopped us and showed how the attacker could take advantage of sloppy technique by the defender and end the awase before move #16. He explained that it was within the spirit of the form to exploit advantages opened up by a lack of mindfulness on the part of the opponent. He added, in that instance, that the deviation he suggested in the attacker's tactics was not something he'd learned from Saito Sensei, but that it was consistent with the martial spirit and intentionality of the form - the script - that he did learn from Saito Sensei. Practicing this form simply as a series of interlocking movements between the attacker and defender can produce an interesting demonstration, but to really inhabit deeper layers of this awase it is necessary to study the psychological script, the mental chess game between the attacker and defender that reflects the stark, practical psychology of life and death. In the panel on the right there is a quote from Saito Sensei about piercing through the center of opposition. When I first saw this demonstrated, probably by Dennis Tatoian Sensei, and later by Hans Goto Sensei and a few others, I thought, "wow, that was fast!" The cut is straight through the attacker's center, piercing like an arrow, through everything inconsequential, or rather, making everything else inconsequential. Here's Martine doing it to Carmen at class last night. We were practicing a ki no nagare variation of Morote Dori Kokyuho, one that our old teacher Dennis Tatoian had really liked. As the attacker reaches for your arm you capture his mind and move your body so that is is like a jo, straight and thrusting up through the attacker's center. As I remember Tatoian Sensei, this piercing through the center was the main theme of his Aikido. He didn't waste time or energy with lots of leading uke around in circles. He would simply go straight through your center, regardless of what technique he was demonstrating, and you'd have an abrupt meeting with mister mat. An especially clear example of this principle, and one that really distinguished him from other teachers, was his irimi nage. Instead of drawing uke into a converging spiral, most of the time he would simply cut immediately through uke's center at the neck as he moved behind the attacker. The experience of this is that of having your neck on the edge of being neatly snappped. I remember him holding me at this edge for long seconds while he talked to the class about body position, hanmi, and so forth. It was very scary, though I knew I was never in any danger, unless I were to try to get away. Now that Tatoian Sensei is gone I am hoping that we can keep alive a practice that elevates this simple principle of fiercely cutting through the center. It seems to simplify, which is a good thing in an art as confusing as Aikido. As I watch young students like Martine I get the feeling that this principle that Saito Sensei, and his senior students in turn, held to be so important is not getting lost, and that makes me happy. 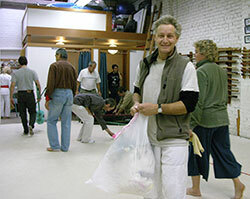 On Thursday I found out that Les was having his 3rd Dan test at Bay Marin Aikido today. I'd missed Simone's test last May and have regretted it, so I decided to see who was up for a trip down to San Rafael this morning. Martine wanted to go so I picked her up at her house and we headed south through the morning fog. First to arrive at the dojo, we went in, turned on the lights and stashed our weapons. Shortly I saw Sensei heading across the parking lot toward the front door. It was Martine's first visit to another dojo, and I could tell she was a little nervous, she even said so. I was thinking that she would have no trouble holding her own on the mat. She has paid attention to fundamentals, keeps a good hanmi, and has great spirit. Part of the stress of being a newcomer at an unfamiliar dojo, in addition to training insecurity, is not knowing local etiquette. Sensei arrived and greeted us. I was happy he got a chance to meet Martine without lots of other people around. He was gracious as usual. After weapons class Les arrived along with a cadre of other students who had all come out to support him in his test/demo. The mat was crowded for warm ups, and during class we had little room for ukemi. The attack was kata dori, which we'd worked on this week also in Petaluma. Martine was training with Karen, and then I joined them for a round of Ikkyo. Martine made Karen laugh when she plowed her hip into my ribs for the final take-down. It was truly great. Near the end of the period Sensei told us all to relax at the edge of the mat and Les and his Ukes came out and bowed in. Les has a ferocity that he was completely in touch with today. Here he is above, throwing Rex during the Tachi Dori. His Randori was smooth and fluid, and soon he was doing the final Kokyu Dosa. As he bowed out the whole dojo erupted in applause. His family must have been very proud of him, especially his young son, who ran around on the mat later doing mock rolls. That reminded me that part of what I love about Aikido is simply the freedom to fall down and get up without getting hurt. On the way home Martine said she had fun, which I already knew from having stolen a glance at her training during the two hours of practice. It may end up being a field trip we make more often, especially since a few people asked me when we were going to revive the early weapons class, which I've had to put on hold this year because of my crazy schedule. I'm hoping that early next year we'll be able to start up again, at least a few weekends a month. Meanwhile, it was good to see old friends and training partners. I really have to get out more. Time just slips away, and there you are. 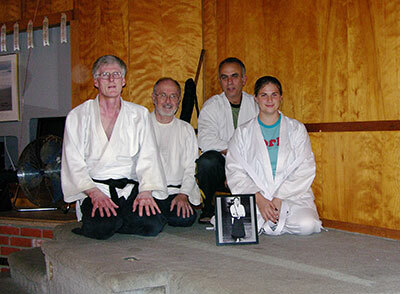 Actually, here we are: me, Bill, Carmen and Martine, after our first class in our new dojo space in Petaluma. We had been training twice a week at the local community center since May of this year, but the space was too small and we couldn't store our mats, so it wasn't a fit. Our new space is all wood, old, with windows and mirrors. Basically, it's a perfect dojo space. When we're not there it's a dance studio. We've been working on the stuff for Martine's 5th Kyu test, and tonight we focused on a few techniques involving punches, munetsuki; and shoulder grabs, kata dori. The major focus has been to pay enough attention to your attacker's body to be able to find its center and connect with it with your whole body. This isn't metaphysics; its physics. You have to find your own center, then using leverage, extension, and ki to reach into the attacker's body and locate its center. Once you connect with the attacker's center you can know their body and find the path for movement with them through the technique. This way you do not force them somewhere they do not want to go, you guide them somewhere irresistible, somewhere their body wants to go. All because you paid enough attention to them. What is so difficult about this, it seems so simple and easy. Yet we go so fast and do not take the time to envelop the attackers body with our mind, to understand them, what they care about, where their center is, where they want to go. It's a discipline, slowing down your mind and expanding awareness to include the other, knowing their body and moving harmoniously with them to a safe resolution. 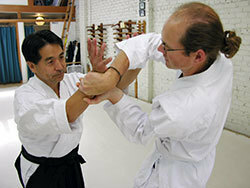 It is also in the context of applying a martial art. It is this discipline that will be the foremost aspiration in our new dojo. The fact that we are exploring it in the practice of Aikido is only incidental. We could be applying it while driving on the freeway, or in line at the ATM, or when someone doesn't agree with us. As I've said here before, Aikido practice doesn't necessarily make you better at managing conflict off the mat. But the practice of including the other, and taking time to feel where their energy is, is something that can help us improve both our Aikido and our effectiveness in the everyday jostle. Cory, Akiko San, and I had been practicing Ikkyo from the two-handed attack, Morote Dori. The variation we were attempting involved cutting forward with the grabbed hand so that uke steps forward, and then striking back into uke's center with the tegatana, unbalancing uke and setting up the final, spiral cut that brings uke to the mat. This is a complicated sequence, and we were struggling with it. Goto Sensei sat us down to show how the striking hand must find the space between the attacker's wrist bones and strike through this space, not through the hand or the bones of the wrist, if uke is to be made light. He demonstrated this showing his tegatana striking straight through the hollow space where Cory's hand attaches to his arm. Goto Sensei continued to explain that it is the same strike, through the empty space of the wrist between the bones that makes Kote Gaishi and Nikkyo work as well. He showed that cutting through the space between the bones requires hardly any effort, and, with proper body position and ki extension, unbalances uke very easily. Goto Sensei's advice echoed Chuang Tzu's story of the cook who in nineteen years never needed to sharpen his knife. "Prince Hui's cook was cutting up a bullock. Every blow of his hand, every heave of his shoulders, every tread of his foot. . .every chhk of his chopper, was in perfect harmony. . .
'Sire,' replied the cook. . .'A good cook changes his chopper once a year--because he cuts. An ordinary cook, once a month--because he hacks. But I have had this chopper nineteen years, and although I have cut up many thousand bullocks its edge is as if fresh from the whetstone. for at the joints there are always interstices, and the edge of a chopper being without thickness, it remains only to insert that which is without thickness into such an interstice. 'By these means the interstice will be enlarged, and the blade will find plenty of room. It is thus that I have kept my chopper for nineteen years as though fresh from the whetstone.' . . . 'Bravo!' cried the Prince. 'From the words of this cook I have learnt how to take care of my life'." Thus, it was that Goto Sensei revealed how his own tegatana has remained so sharp. 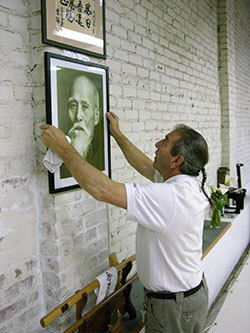 Morihiro Saito Sensei made an incalculable contribution to Aikido by synthesizing the chaos of what O-Sensei taught into a systematic curriculum. 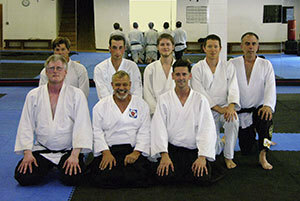 The orderly progression of students through this organized curriculum is the path of Iwama Style Aikido. 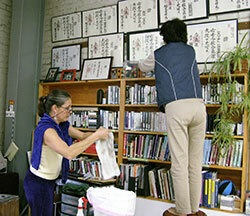 Some may complain that the spontaneity and creativity is leeched out of the art by this organized style of practice, but Saito Sensei would tell students that, "in order to go fast you first must go slow," and learn the basic forms, footwork and hip movements, before aspiring to high levels of practice. 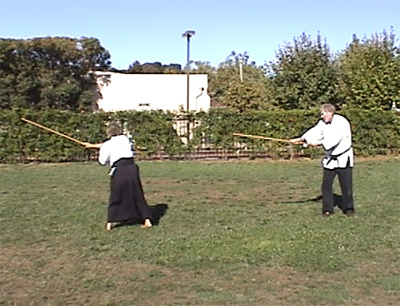 Saito Sensei spent a great deal of time organizing O-Sensei's sword forms into basic fundamentals, or suburi, and then he further built on these to create short kata-like forms or awase for partner practice. These flowing paired forms with the bokken, or wooden sword, crystalized into the Kumi Tachi that we still practice today, and they played a role in the development of the Ken Tai Jo, or Ken against Jo awase forms. 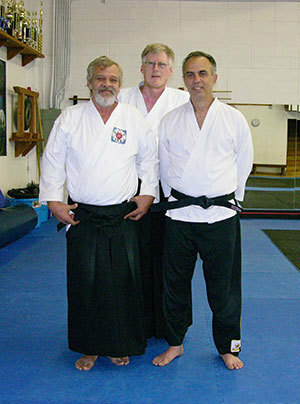 During the time that Dennis Tatoian Sensei studied at the Iwama dojo Saito Sensei taught the Kumi Tachi with many variations all ending in different ways. Following the principle of Riai, in which weapons forms and empty-handed Aikido were identical and fully informed by one another, Saito Sensei organized these variations into two categories: sword method and body method. In the sword method endings, the Kumi Tachi and variations all ended with a killing sword thrust or strike. 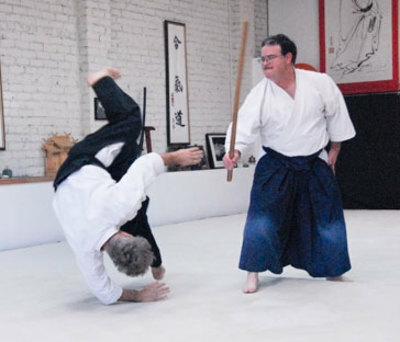 Conversely, with the body method endings, empty-handed Aikido techniques were used, much like the endings of the Tachi Dori, or sword taking techniques in which an unarmed defender defeats a sword attack. Today Tatoian Sensei stood out on the mat at the beginning of Sunday class and said, "what do you guys want to do today?" Carmen and I looked at each other thinking, "anything you want to shows us would be perfect." But then I asked out loud, "would you show us the sword method/body method variations of the Kumi Tachi?" I knew that Tatoian Sensei felt an appreciation for Saito Sensei's systematic curriculum, and that Tatoian Sensei would shortly be returning to his new home in the Phillippines. It seemed like a great time to have him guide us through the Kumi Tachi variations. While there are endings possible at each and every strike or thrust point within the Kumi Tachi, Saito Sensei had taken great care to teach both sword endings and empty-handed endings at the conclusion of the first and second attacker strikes. Tatoian Sensei began us with the first Kumi Tachi and showed us sword method and body method endings at each of these points. His approach was to have Carmen and I do one round of stop-start practice and then a round executing the form in a flowing awase manner. Once we had completed this he would come back on the mat and show us the variations. Many of the sword method endings involved a simple entry, slicing into the attacker's center as the attacker rose to strike, while some involved stepping off on a safe angle and striking at the head. One of the more interesting sword endings was to mimic shiho nage with a slice across the attacker's mid section and then a 180 degree turn for a final strike. The body method endings included Kote Gaishi, Koshi Nage, many Kokyu Nages, and a Hiji Waza ending in which you capture the striking right arm with both hands and, with a right hip turn, drive the attacker to the mat while his sword arm is brought straight up. Over the course of an hour and a half Sensei systematically provided us with a tour of Kumi Tachi variations for all five forms: sword method and body method for first and second strike endings. I'd seen some of these in bits and pieces over the years, but never a coverage of all five forms with variations for first and second strike. As I left the dojo I felt a surge of appreciation for Saito Sensei's contribution in making Aikido accessible to us mere mortals in a way that resembles a curriculum. The nice thing about a systematic curriculum is that things tend not to get lost or fall through the cracks over time. At the same time I felt a little of the same sadness that I felt in January when Tatoian Sensei went away to the Phillipines. At that time we knew he would be back for a while during the Summer. This time there is no clear expectation that he will be back at all, with the exception of short visits now and then. That means that the responsibility of keeping the curriculum fresh and interesting falls on those of us who are trying to keep the dojo together and move it into the future. Today's tour of the Kumi Tachi variations will contribute greatly to our ability to pull this off. A great deal of significance is laid on the fact that O-Sensei was only 4'11", yet he could effortlessly throw attackers many times his size. The subtle art by which he was easily able to defeat larger, stronger opponents is the Holy Grail, the essence of what we seek in the study of Aikido. Since O-Sensei was so small yet indomitable, it is no surprise that others of tiny stature could, through long years of excruciating practice, gain great skill in Aikido, and through this skill throw opponents many times their size and weight. Perhaps the greatest living exemplar of this expertise, now that O-Sensei is gone, is Dragonfly Sensei. She is very small and perhaps weighs no more than an ounce or two, but she is able to capture both the mind and body of any large human. She deftly uses the energy and intentionality of the attack, often in the form of a whistling strike with a bit of rolled up newspaper, absorbing the force and turning it, with prodigious breath power, to her advantage. 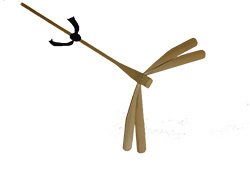 Here is a picture of Dragonfly Sensei. Today, as I entered the dojo for a regular morning of practice I saw that class would not be routine at all; there was Dragonfly Sensei zooming around the rafters, diving and swooping down into the dojo space doing her various warm-up katas. All the other students were stretching and loosening up at the far corners of the mat, hoping that they would not get called to take ukemi from her, so formidable is her reputation. 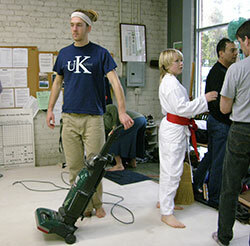 Scott, one of the senior black belts ended up as her chosen uke for demonstrations. Scott is very agile and graceful, and he lands very lightly from breakfalls. This latter ability is a plus when taking ukemi from Dragonfly Sensei, since you may be thrown from any part of the dojo, even from up by the skylights, where she prefers the warmth and light. The first technique she demonstrated was her famous "nose-pin" technique. This technique involves the simultaneous capture of the mind of uke, as she strikes directly to the center of his face, and a painful joint lock on the nose, which buckles the knees and takes uke to the mat. Here she is shown at the very instant of application of the joint lock. Scott's face still reflects the surprise at her entry, and hasn't had time to adopt the grimace of pain in response to the joint lock. When this technique is inexpertly performed it can cause lasting pain and a strange deformity, which is a source of frustration to ukes, thus the phrase: "got your nose out of joint." 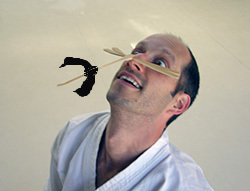 Fortunately, Dragonfly Sensei always performs the technique flawlessly, and Scott, once released from the pin, showed no lingering effects. 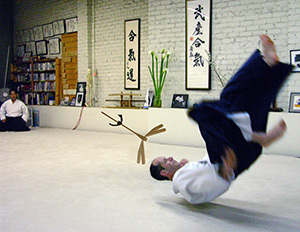 The next technique was a kokyu nage in which she flys offline avoiding a punch, and then she pivots in, draws uke under her wings, and propels him across the mat. Scott again was chosen to take this fall. Here he is in mid-air as Goto Sensei looks on in wonder. When we tried it uke was very heavy on top of our arms. This was embarrassing since our arms are much sturdier in every way than the fine filaments and membranes of her wings. Yet, when she demonstrated the technique her wings fairly bristled with ki and snapped Scott so hard that he flew quite far horizontally across the mat. After class we hoped to talk for a while with Dragonfly Sensei about her many trips across the sea to Japan, where she studies still with her own lofty teachers. But as soon as she clapped her wings to bow out she darted across the dojo, turning in flight at the door to bow once again, and then streaked out into the morning air. As always there were jokes about the cruel fate of the poor unfortunate oaf who tries to swat Dragonfly Sensei, not knowing she is an 8th degree black belt and quite capable of flicking even the largest, strongest brutes to the very ends of the earth.